PLEASE I AM 5 FEET 6 INCHES TALL AND 125 POUNDS. MY HUSBAND SAYS I CANT PHYSICALLY HANDLE A VMAX MOTORCYLE. IF I HAD IT LOWERED? I KNOW THE SEAT HEIGHT IS 30 INCHES. replaced my headlight with a newer model on my 1999 kawasaki drifter and it worked fine for about 4 days now it has blown the low beam bulb but high still works suggestions on what i should be looking for? I am new to "owning" my Harley and I want to be able to winterize it on my own. 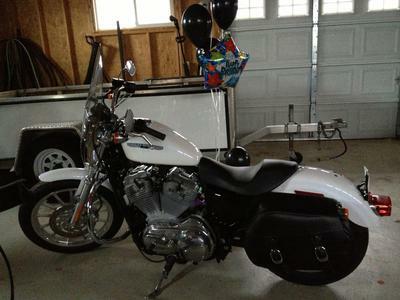 My husband does not ride and he supports me 100% (in fact he surprised me with this bike for my 50th birthday) - Amazing!!! I want to know how to winterize it for the (Place sarcasm here... "wonderful") Minnesota winters we experience. Several opinions out there about winterizing do's and don'ts. Should I run it low on gas and add Seafoam or should I fill the gas tank and add seafoam? It's a Harley-Davidson 2006 883L Sportster. I just want to do it right and take care of the best birthday gift I have ever received. I want to be able to do this type of maintenance myself and not have to bring it in to have it winterized. I can do this! I want to do this. I just want to do it correctly. You can also read what people on the Harley and XL forums do. Seafoam vs. Stabil has been debated forever. Some use Stabil, some Seafoam. Fill your gas tank, add Seafoam (I prefer it over Stabil - Seafoam cleans your carbs and millions of people use it - and it keeps them from getting varnishy from gas over the winter) and run it for a few minutes. I believe its one ounce per gallon is how much to put in after you gassed it up. Most places don't carry gas without ethanol anymore - if you do have a station that carries it, use it, if not, the gas your manual recommends is just fine. Note also, Stabil has only a two year shelf life. Many people have used it and wondered why their carbs were green and gummy after the shelf life expired (helps to read fine print). So, you can GO AHEAD AND USE SEAFOAM which is preferred by millions not only for bikes, but mowers, cars, boats, in oil, etc. or you can use Stabil, I suggest researching the pros and cons on the 'net - there's lots out there. Recap: Fill tank, add Seafoam or Stabil, hook up the battery tender and it should start right up in the Spring. DO NOT USE SEAFOAM, IT IS NOT A FUEL STABILIZER. It is mainly used to clean out engine deposits, and carbs to some degree. My suggestion is to find a station that carries NON-ETHANOL gas, and fill the tank as full as possible. The less airspace, the less chance for the gas to evaporate and have condensation form in the empty area of the tank. Then buy some STA-BIL (that's the brand name of the best fuel stabilizer) and fill your tank with the non-ethanol and the proper amount of Sta-Bil. When you get home, turn off the fuel on your petcock, but keep the bike running until the carbs are empty...the bike will die when all the fuel is drained out of the carbs with no new fuel flowing in because the petcock is in the off position. The lack of fuel will prevent most, if not all of any dried fuel varnish accumulating in the carbs, especially in very small passages like the pilot jet. Keep your battery on a maintenance charger so that it stays in good condition. Hopefully, your garage is insulated to some extent so your bike won't be sitting in subfreezing temps much of the winter. Those are the most important things to do when winterizing your bike. I have no idea, so good question! I ride year round, so I've never had to worry about it. Good info to have, just in case though. it's extremely easy...I have been doing my own for 3 years now...fill the gas tank up and add fuel stabilizer (I use the red stuff)...run the bike for about 10 minutes so that the stabilizer gets throughout your entire fuel system...hook up a battery tender (one that switches automatically to a trickle charge once the battery is fully charged) and voila, you are done!! !...I store mine in a garage that is not heated but is somewhat insulated in that I live in a townhome and have garages attached on either side...if you store it outside you will want to put a cover on it as well as some steel wool in the tail pipes to stop little critters from crawling in to your exhaust...if you have a stand you can jack it up to keep the tires off the cement floor, but I've never done it and have had no problems...I have also had both carbureted and fuel injected bikes and have used the same method for both...no need to do an oil change, just do it in the spring at the start of the season...no need to drain and remove the carbs unless it's a really old bike...good luck and enjoy your ride! can husband and I ride a 250 motorcyle together? Comments for can husband and I ride a 250 motorcyle together? My first bike was a GZ 250 and it was a great starter bike to build my skills. I agree the gas mileage was great. I rode a lot of back roads on my 250. Highway riding was not the best. Winds and storms were challenging. As far as riding another passenger, I never tried. I did belong to a GZ forum and some of the men were 200+ pounds. As a suggestion, you may want to visit a forum for the bike you are choosing and ask the rider's their experience with passengers. Happy riding!